Sewer spills are a messy, dangerous problem inherent with antiquated municipal infrastructure. Here’s how IoT and analytics are helping. Take an antiquated system of infrastructure, neglect it, and hope that nothing goes wrong. That can be an expensive, time-consuming proposition when something actually does go wrong. It’s certainly no way to manage a network — especially if it is the network of pipes that carries sewage away from homes and businesses in your neighborhood. Greg Quist didn’t set out to solve this problem of sewer spills back when he was studying astrophysics in college or when he went to graduate school for theoretical physics. His career started with work on stealth technology for the US government — the kind he can’t tell you about. But in opposing a residential development project in his California neighborhood, Quist accidentally fell into sewers — as a career, not literally. For the past several years Quist and his company, SmartCover Systems, have been equipping sewer networks with IoT-enabled sensors, collecting data, performing analytics on that data, and hosting the data in the company’s data center. The company has analyzed the sewer data and is able to detect when parts of a sewer network need maintenance. Here’s how it works. 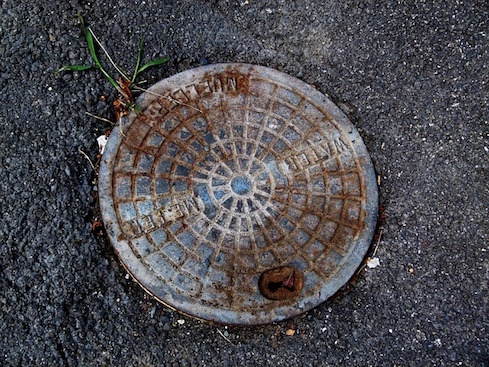 SmartCover’s sensors, which use ultrasonic technology and a proprietary algorithm to detect water levels, are attached to the bottom of manhole covers. Quist said they are about the size of “George Costanza’s wallet,” and they are contained in pods rugged enough to protect them from the dangers of their environment — water and sewage. These devices are smart enough to perform analytics themselves. These were devices that implemented analytics at the edge before anyone was really using that terminology. (Quist said they called it “highly distributed intelligence” back when they first deployed it in 2005.) The analytics filters the noise and sends only the relevant data — each device sends only about 10 bytes of data back to the central servers each hour. There are two times of day when water levels typically increase, Quist said — in the late morning and the early evening, coinciding with when people are taking showers, flushing toilets, and cooking meals. If rises in the water levels happen against that pattern, say at 3 am, that likely indicates there is a problem. Problems with sewer spills typically come from two causes. Roots from trees can grow into the systems. Plus, sewers can get clogged with fats, oils, and grease — the stuff that some people may pour down the drain after they cook. Quist said those things clog the pipes just like they clog your arteries. That’s what SmartCover customer, the San Antonio Water System, did. SAWS is a big sewer system with over 100,000 manhole covers, and 540 of those have been equipped with SmartCover sensors. The system has been able to drop its service bills by 75% by using data to help optimize the cleaning schedule, Quist told InformationWeek. Plus, avoiding a single spill can save a water system hundreds of thousands of dollars. The US also has about 780 combined sewer systems — systems that collect sewage and stormwater runoff in a single pipe for treatment and disposal. These systems, built before the Clean Water Act went into effect in 1972, are primarily in the Northeastern US. In these systems, excessive rain water and flooding can contribute to high levels and sewage spills. These systems will need to invest about $1 trillion in capital infrastructure in the next few decades to fix these issues, Quist said, but in the meantime they can better optimize their systems. For instance, some of these systems, such as the city of Newburgh, New York, must report overflows to the public and advise them on how long they should stay out of the river or other waterway. It’s a messy, dirty problem. But modern analytics and IoT systems can help improve management of these systems and their impact on the environment and the lives of residents and the operation of local businesses. “This technology, which seems simple in the IoT and big data world, is making a huge impact on the water and waste water industries,” Quist said.